For any chemist embarking on the synthesis of a particular compound, the prospect of using a chemical reaction which will very rapidly form the desired product in high yields without any fuss is highly attractive. Click chemistry reactions are the embodiment of this concept and are now widely used as efficient and versatile methods for the synthesis of radiopharmaceuticals. Click chemistry transformations certainly make the lives of radiochemists a little easier, but even more importantly, the speed and simplicity offered by these reactions address a fundamental challenge in the production of radiotracers: the short-lived nature of many radionuclides, particularly positron emitters. 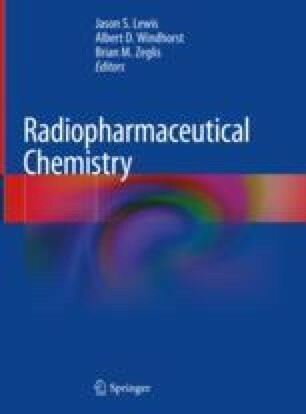 In this chapter, we will introduce a variety of commonly used click chemistry reactions and describe how they have been applied to the preparation of radiopharmaceuticals. The concept of pretargeted imaging and therapy will also be introduced with special emphasis on how click chemistry reactions have been refined for these applications.